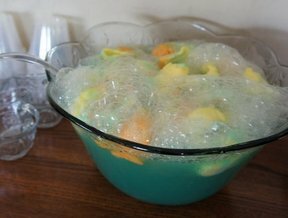 Refreshing and easy to prepare, this punch is a healthier alternative to sodas for serving at kids parties. Refrigerate all ingredients before mixing. Place ice ring in punch bowl. Add cranberry juice, ginger ale, lemon juice and orange juice. Stir. Optional: Add slices of orange and lemon to punch bowl to garnish.